Well we're finally getting a break from the triple-digit temperatures. We're now in the mid to high 90's (woopee!). Our break came on Saturday night from one of those high heat-induced crazy thunderstorms. Thunder, lightning, straight-line winds, and a gully-washer. All of which managed to knock out power around the town and destroy some trees and electrical poles. But it also knocked back the temperatures and then the arrival of Eduoard to the coast gave us a few clouds to block the sun. Ah, the relief! Yesterday I decided to check out the garden with my camera in tow and see what flowers are managing to hang in there. I was surprised at how nice a few things looked. Since I haven't figured out yet how to intersperse the photos with my text, I'll start at the top. The first pic is of an annual I bought at our farmers' market. 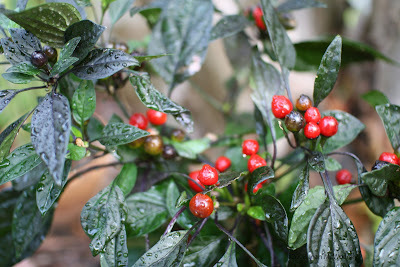 It's an ornamental pepper called 'Black Pearl'. The peppers start out purplish-black but then turn red. You can actually eat them and they're quite hot but they're not really that tasty. 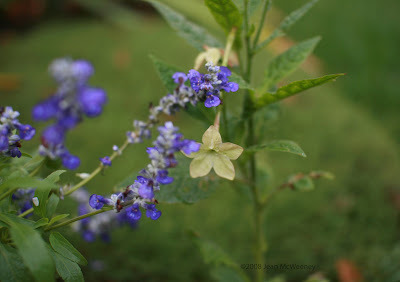 The next picture is of a Victoria Blue salvia in front of a ‘Perfume Lime’ nicotiana. The salvia really popped last month behind a bright gold coreopsis (an unknown variety) but this picture makes a real sweet contrast. This nicotiana plant is very small, probably because it's a seedling of the original from last year. And by the way, it never did have much of a fragrance. 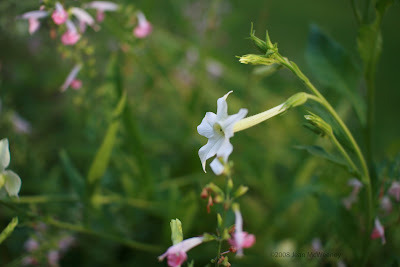 The last photo is of a white nicotiana (unknown variety again; sorry, it wasn't labeled!). Behind it is Salvia 'Coral Nymph'. I love how delicate they look together. I was amused and a little proud to see the same combination of plants used in one of the fabulous public planters in downtown Chicago this July. This nicotiana is definitely fragrant.